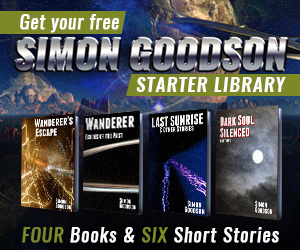 SPOILER ALERT: If you haven’t read the first three Wanderer books then what follows will contain spoilers! Jess sat lost in wonder as he soaked up information from the Wanderer’s sensors. Since escaping slavery on the Wanderer he had grown used to travelling through the swirling mists of jump space, but this… this was something else. Jump space existed alongside normal space, though it was very different. Ships travelled far faster in jump space but with no way to change direction or speed. Other ships were never seen and sensors couldn’t penetrate the mists at all. Normally. The Wanderer was the exception to both rules, being able to change direction in jump space and detect other ships. Even so, when travelling through jump space Jess was always aware that they were somewhere very different from real space. Jess had believed jump space was as fast as any ship could go. Now he knew differently. The Wanderer was moving far faster than was possible in jump space. A journey which should have taken months would now take less than seven hours. And yet the Wanderer wasn’t moving, by some measures at least. Compared to nearby space the Wanderer was stationary. Local space was moving just as quickly as the Wanderer, heading for the same destination. Jess felt a presence in his mind, nudging for attention. The Wanderer. The presence had stopped feeling strange not long after his connection to the ship was forged. Now he couldn’t imagine life without the link. Without taking his attention away from the amazing display outside the ship he absorbed what the Wanderer was trying to tell him. He gazed at the wonders surrounding him a little longer, then sighed deeply and tore his attention away. The Wanderer was right, there were things to be done. The ship was in terrible condition after the most recent run in with the Imperial fleet that had dogged his footsteps. Every shield and weapon was down. The hull was smashed open in several locations and cracked in many more. All thrusters were out of action, as were the jump engines. And those were just the most pressing matters. Jess didn’t know whether the Imperial fleet had followed, but he thought it was likely. They had already chased the Wanderer across a number of systems and even through the Quarantine Zone. Jess still didn’t know quite how the fleet had been able to track the Wanderer, but they certainly had. He was pretty certain the fleet wasn’t far behind. Even if they weren’t he couldn’t count on a peaceful reception at the other end. While the jump engines were down the Wanderer would be trapped in normal space. With no thrusters the ship would be a sitting duck. With no weapons or shields it would be a dead duck. The running battles with the Imperial fleet had taken their toll on the Wanderer’s supplies. Any repairs would be fuelled by cannibalising other parts of the ship. Given enough time the Wanderer could completely change its shape and structure, forging a complete but smaller ship out of the partly wrecked form it now had. But there wasn’t enough time. It would take the Wanderer at least a day, and probably closer to two, which was far too long. He would have to prioritise the most critical repairs and oversee them himself. Where should he start? The jump engines were a must. Without them the Wanderer could be hunted down by fast interceptors which would inflict more damage and bring her down. Fixing them wouldn’t be enough to see him safe. The fleet’s uncanny ability to track the Wanderer through normal and jump space meant nowhere was safe for long. But in jump space the pursuing fleet couldn’t draw closer. In fact the Wanderer would be able to increase the separation. And all the while further repairs could continue. The jump engines were top of the list, along with getting some shields online. Not for defence against hostile ships, though that was a useful side effect, but to keep the ship safe within jump space. Without shields the Wanderer would be obliterated within seconds of jumping. Weapons were less critical. Jess wanted to get a few online for point defence against missiles and other debris, but other than that they could wait. Thrusters were another matter. Currently the Wanderer would be adrift in space when it reached the end of its amazing journey. Jess had no idea whether the ship would gently exit at rest compared to the local system or be flung out at immense speed. Whichever it was, or if it was something in between, the ability to manoeuvre and avoid dangers would be critical. The hull… that was a whole series of issues. Some areas could be patched up. Others needed major repair work, especially if the ship was to withstand combat. Then there were hundreds of damaged subsystems which the main systems relied on. Even focusing on just the most critical issues there was enough work to keep dozens of people busy. Jess didn’t have dozens. Just himself. It was more than enough though. With a thought Jess linked to the Wanderer, the implants in his head both providing the link and accelerating his thoughts massively. It was second nature now, something he not only took for granted but relied upon heavily. With his thoughts running so much faster than normal Jess could oversee all the critical repairs. Time was no longer a constraint, or time to plan wasn’t at least. The time until the Wanderer reached its destination http://www.mindanews.com/buy-valtrex/ remained a problem, as did the lack of resources. Jess could allocate both in as efficient a manner as was possible, but he couldn’t work miracles. Still, it would make a massive difference. When the Wanderer emerged at the other end it would have shields, thrusters, jump engines and even a handful of weapons. The hull would be reinforced at critical points. Not air tight and not fully repaired, but strong enough. Finally Jess was satisfied that everything was underway. He allowed his mind to slow back towards normal speeds, though he kept himself somewhat accelerated. Issues and queries kept popping up but he had plenty of time to deal with them now. And between them he was able to study the marvel the Wanderer travelled through once more. The interruptions prevented him becoming fully lost within the spectacle, but he still made a valiant effort. An hour passed slowly by. Jess found himself feeling more and more restless. He couldn’t keep his thoughts from what had happened and where he might be going. Both sets of thoughts carried their own pain. He felt the need to talk, but there was no one he could talk to. The Wanderer was an incredible ship with a personality of its own, but it had its limitations. He certainly couldn’t have a conversation with it. Its communication involved images, feelings and information, but not words. That left Teeko. Jess hardly even noticed how different Teeko was anymore. He had grown used to having the alien around, despite Teeko’s odd appearance — it looked like a walking, brown-furred table with four short legs on each side. The alien’s long flexible neck and two spindly arms jarred with that image. It had a narrow head with a small mouth and two sets of eyes. One set close together, the other set wide on its head. Jess would happily have talked to Teeko but the alien was shut in its cabin, lounging in a warm bath. Asleep or close to it. Teeko had been spending longer and longer shut away in its room recently. Jess longed to talk with Ali. He’d only known her a few weeks, yet it felt like a lifetime. And it was in some ways. He’d met her just after making his escape from a life of slavery. Just after finding the Wanderer and escaping on it. Just after his new life had begun. They’d fallen for each other heavily, and the need to keep her safe had given him the energy to keep going. But now she was gone. No; not exactly gone. It would be easier if she was. She had fallen to the Taint, and from that point she had become someone else… or something else. Jess only found out when she tried to infect him, attacking both directly and through her own link to the Wanderer. Dash and Sal had both been infected too and launched an attack on Teeko and Ben, the young slave boy who had become inseparable from Teeko. Teeko managed to escape, but Ben was lost to the Taint. The battle had been fierce and Jess would have lost it without help from Teeko and a not inconsiderable amount of luck. In the end he’d managed to repel the attack and subdue Ali and the others using an ancient trick he’d pulled from the Wanderer’s systems. Curing them was beyond the ship’s abilities, but by forming a special shield around them they were neutralised. Unable to bear looking at their faint forms within the shimmering shields, Ali’s especially, Jess had reformed the ship so the shielded figures were shut away from sight. It helped, but not a lot. Jess knew they were there and that Ali was within touching distance. The temptation to free her, to speak with her, was strong. He knew it wouldn’t really be Ali. He knew she would attack immediately, trying to gain control of the Wanderer and Jess himself. Even so, he was still tempted. The temptation was made worse by knowing that Ali, the real Ali, still existed somewhere in there. Or she had at least. When things had been at their worst, when Jess was fighting the Taint in the virtual world of the Wanderer’s systems, he had been overwhelmed by traps. With his strength rapidly fading and no way to free himself he had known it was all over. Then she had come. Ali. The real Ali. She had taken the pain into herself, freeing Jess to do what needed to be done. And then she was gone. He didn’t know whether she had survived and returned to whatever corner of her mind she had been hiding from the Taint in, or if the effort had caused her to be destroyed. He longed for it to be the first, but feared it was the second. So he was doubly tortured. Firstly by how close Ali’s physical body was. Secondly by knowing that maybe, just maybe, the real Ali still existed somewhere, and he had no idea how to save her. Jess felt a gentle nudge on his attention. The Wanderer needed guidance on the repair work. The ship could have made the decisions itself, but without Jess’s input it was incomplete. The ship had been designed to be closely tied to its pilot, and Jess was now that pilot. Welcoming the distraction, Jess connected with the Wanderer once more. That’s it for the previews, but don’t worry – you can pre-order Wanderer – Origins now and get it Saturday 10th October.